ISUZU TROOPER INJECTOR SEALS (1 SET). Our friends over at Isuzu Trooper Owners Club UK - search ITOCUK. Cash on Collection. Credit and Debit Cards. Google our friends over at ISUZU TROOPER OWNERS CLUB UK. Cash on Collection. Credit and Debit Cards. Isuzu Rodeo/D-Max3.0 Diesel Fuel Injectors 2007 Onward. We will keep a record of the injector numbers so if there is a problem we will require the injectors to be sent back. Engine Block. This will not require any polishing or any machining and it is ready to be fit in. Google our friends over at ISUZU TROOPER OWNERS CLUB UK. Holden Jackaroo 3.0LTD 4JX1. 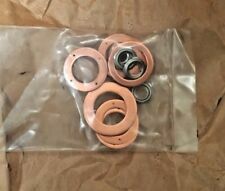 O Ring Gasket Washer Kit injector. They are still Genuine Isuzu parts. INTERNATIONAL ORDERS. We are at the back of the building. Unit 12/16-18 Northumberland Rd, Caringbah NSW 2229. Part Number A500001R61120. 2015 ISUZU D-MAX Injection Rail. This item has been removed from a: 2015 ISUZU D-MAX. Year: 2015. Make: ISUZU. Part Type: Injection Rail. Fuel type: Diesel. Vehicle Colour: White. BRAKE PAD WEAR. FUEL SYSTEMS. DENSO Automotive Systems Australia is based in Croydon, Victoria. FUEL PRESSURE REGULATOR. BRAKE & CLUTCH PEDAL. ABOUT DENSO Universal Joint. Billet Fuel Pump Brackets. Vehicle Isuzu. The vehicle match list is only intended to assist in your search. Part Number 4jg2-hochdruckpumpe. 57577 Hamm/Sieg. Auf'm Rottland 5. Opening hours Auf'm Rottland 5, 57577 Hamm/Sieg. Fuel Injection Pump. • Diesel • In-line injection pump. BOSCH • 31 65144 10177 2. Just ask us and we can do a much better check. VEHICLE COMPATIBILITIES. PART NUMBER: D3282. Other Part Number 8490713. Manufacturer Part Number D3282. IT IS BEEN REMOVED FROM ISUZU TROOPER 3.0 TDI. ONCE AN ITEM IS RECEIVED BACK IT WILL BE QUALITY TESTED ON OUR BENCHES AND CHECKED FOR A MATCH WITH THE ONE SOLD. 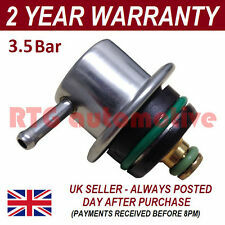 Repair Kit for Isuzu 4JA1 4JB1 Diesel Fuel Injection Pump. Includes drive shaft seal and free instruction sheets. What a great help, i can`t say enough about the service i had. Save £££££££££££££. Vehicle Isuzu. Opening hours 57577 Hamm/Sieg. Auf'm Rottland 5. Auf'm Rottland 5, 57577 Hamm/Sieg. Mileage in miles. Series ab 10/2006. Year of construction 2010. Fuel Rail Pressure sensor for Holden Colorado and Isuzu D-Max 3.0 diesel 4JJ1. These Fuel Rail Pressure sensor fitted to various Holden Colorado and Isuzu D-Max with 3.0 diesel 4JJ1 4 cylinder engines as per the table below that use part number 55PP05-01. To suit Holden Colorado and Isuzu D-Max 3.0 diesel 4JJ1. Holden Colorado 4JJ1 3.0 Diesel 4 2008-2012. Isuzu D-Max 4JJ1 3.0 Diesel 4 2007-2012. Fuel Rail Pressure Sensor. Injector Holder. Belt Tensioner Wheels & Bkts. Suspension Ball Joints. Rear Lights. Front Exhausts Cats. Estimates can be provided beforehand but prices may differ upon ordering. The compatibility is only a guide. Genuine Isuzu & Holden Rodeo D-Max 2.5L & 3.0L Fuel Rail Pressure Relief Limiter Genuine Denso Product 12 Month Warranty Isuzu Genuine OE Part Number: 8-98032549-0 Holden Genuine Part Number: 98032549 Application Suited, but not limited, to: Nissan Navara D40 2.5 DCI: 2005 - on Nissan Cabstar 2.5 DCI: 2006 - on Nissan Pathfinder 2.5 DCI: 2005 - on Isuzu D-max 2.5 and 3.0L Holden Rodeo D-Max 2.5 and 3.0L Mitsubishi L200 2.5 DI ​​​​​​​ Compatitable Part Numbers These OEM / DENSO part numbers are compatible with one another: 98032549 8-98032549-0 095420-0281 0954200281 98032549-0 095420-0260 095420-0280 0954200280. ISUZU NKR77 RODEO 4KH1 4JH1 3.0TD 4HK1 5.2TD. ZEXEL Part NO.:109342-1007. Remanufactured High pressure Diesel Fuel Injection Pump. ISUZU 700P,4HK1 5.2TD 129KW;. ISUZU RODEO,4JH1 3.0TD 96KW;. ISUZU NKR77 600P,4KH1 3.0TD 96KW;. OTHER PARTS AVAILABLE IN OUR. from breaking the following donor vehicle. OPEL - VAUXHALL - ISUZU ORIGINAL PARTS - GENUINE PARTS. FILTERS, BADGES, BRAKES, HEADLIGHTS, WHEEL BEARINGS, GASKETS AND A LOT OF CLASSIC STUFF AND SO ON AND SO ON. SO I'M NOT SURE WHAT CARS/MODELS/YEARS THESE PARTS FIT ON BUT I'LL TRY TO DO MY BEST TO HELP YOU. Full set of 6 genuine Unisia JECS (OEM) Fuel injectors for Holden Rodeo V6 from 2003-2005. These fuel injectors fit The 3.5 V6 6VD1 Isuzu motor fitted to Holden Rodeo RA from 2003-2003. 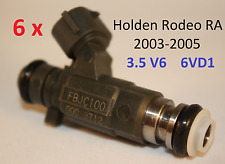 Holden Rodeo RA Fuel Injectors 3.5 V6 6VD1. Nozzle and Holder Assembly. Belt Tensioner Wheels & Bkts. Suspension Ball Joints. Rear Lights. Front Exhausts Cats. Estimates can be provided beforehand but prices may differ upon ordering. Upon receipt, all products will be inspected and at our discretion, credit may be refused. ISUZU TROOPER INJECTOR PIPES - INDIVIDUAL PIPES. Google our friends over at ISUZU TROOPER OWNERS CLUB UK. Cash on Collection. Credit and Debit Cards. From a running vehicle. Nozzle and Holder Assembly. Belt Tensioner Wheels & Bkts. Suspension Ball Joints. Injector Holder: Dual-spring Injector Holder. Rear Lights. Front Exhausts Cats. Estimates can be provided beforehand but prices may differ upon ordering. Cone Copper Washers x 1 (sold in singles). Application: Various Isuzu Injectors. Size 15 x 7.1 x 6.5 mm. 2008 - 2017 ISUZU D-MAX TF. RUNNING GEAR. PEC AustraliaX CLOSE. Part will suit most engines for the above vehicle. This will be of equal build quality and performance.X CLOSE. This will be of equal build quality and performance. Cone Copper Washer x 1 (sold in singles). Application: Various Isuzu Injectors. Size 19 x 9.1 x 7.5 mm. ISUZU DMAX. TO ENQUIRE ABOUT THIS PART. FUEL INJECTOR RAIL. WITH PIPES. ISUZU D-MAX. 2.5 TURBO DIESEL. HOLDEN RODEO RA 3.0 DiTD (TFR85) 1/2007 - 10/2008 4cyl 3L Diesel [ 4JJ1-TC 117kW ] Rear Wheel Drive Ute. HOLDEN RODEO RA 3.0 DiTD (TFR85) 1/2007 - 10/2008 4cyl 3L Diesel [ 4JJ1-TC 117kW ] Rear Wheel Drive Cab Chassis. 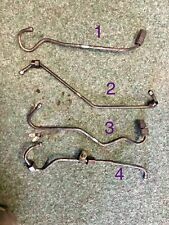 These are second hand parts and may have age related marks. Typ D-Max Rodeo. Vehicle Isuzu. Opening hours 57577 Hamm/Sieg. Auf'm Rottland 5. Auf'm Rottland 5, 57577 Hamm/Sieg. Mileage in miles. Series 05/2002 - 06/2012.